That trip we spilled more beer than most people will ever drink. The former Georgia LB that was with us (he started the fight in the last UGA/tech JV game) was legendary, and 'Bronco fan' kept feeding him pitchers of Coors just to hear T.D. practice stories. You know, this trip will have to be broken down at a later time by myself and redbeard. over their guy Donovan McNabb anyday. 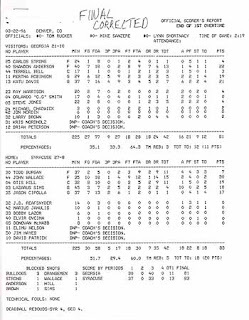 Anyhow, the following link reminded me of the Sweet 16 trip (without the John Wallace heartbreak shot). Check out the read on the trip to Omaha by RVADAWG over on Dawgs On Top. Good stuff. The 'Cuse got some nice bench production that night. Man I could use a road trip right about now. Something about Mark Schlereth annoys me. I can't quite put my finger on it. "My name comes off the stadium"
Georgia Hammers Tech in Baseball...Again.